A tendon is a long, slender expansion of a muscle that attaches to a bone. 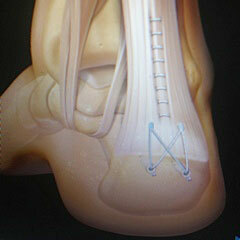 The achlles tendon inserts into back of the heel. It is a conjoined tendon, meaning that there are two tendons that join together from two muscles, one being the gastrocnemius in the calf and the other one being the soleus. The tendons of these two respective muscles actually join together and they literally go through a twisting type of torsion as the Achilles tendon is formed and then the end of the tendon attaches to the back of the heel bone. Movement of a part occurs when the muscle contracts thereby pulling the tendon attached to the bone in the direction of motion. Tendonitis is a condition that occurs when the tendon becomes over-utilized and subsequently inflamed. This can occur when you do too much too soon, or when you overuse your tendon. This is sometimes referred to as an overuse condition. As the condition progresses, the damage to the tendon may increase. With time, pain and swelling may limit activity. In the foot and ankle, the most common sites for Tendonitis are: in the back of the foot the Achilles Tendon, on the inside of the foot the Posterior Tibial Tendon, the front of the foot the Anterior Tibial Tendon, and the outside of the foot the Peroneal Tendon. The inflammation of the major tendon located in the back of the heel. It is the broadest and thickest tendon. One can easily feel this tendon with their fingers quite easily. This structure can become quite tender and can range from inflammation at the end of the tendon where it attaches to the bone which we denote as distal Achilles tendinopathy or insertional Achilles tendinitis. It could be a tendinitis within the main body of the tendon. If the condition is left to become more severe a nodule can sometimes be felt by touch within the body of the Achilles tendon. Further trauma to the tendon and overuse of the tendon can result in an actual partial tear of the internal component of he Achilles tendon. In the most severe cases the chronically inflamed tendon can sometimes fully rupture which would prevent motion of the foot to the leg. In these situations the patient may actually experience and be able to feel by touch an actual gap within the Achilles tendon in the back of the heel. Treatment of Achilles Tendonitis Appropriate medical consultation by a foot and ankle specialist would be necessary if simple home therapy isn't effective The treatment protocol depends upon the specific diagnosis. In general radiographs may be performed. Magnetic resonance imaging may need to be obtained, especially in conditions where there is suspicion of partial rupture or an internal tear of the Achilles tendon. More conservative therapy that may be necessary would be that of using possibly a cast boot for a specific period of time for healing, use of crutches, use of oral anti-inflammatory agents, use of injectable medications to the region. Cortisone injections within the Achilles tendon is considered to be of questionable value. They often can precipitate actual rupture and should be reserved for only certain situations and if they are performed, the foot does need to be adequately protected. If after a bout of more aggressive conservative therapy the Achilles tendon remains chronically inflamed, then there are times when surgical intervention may be necessary for the resolution of this problem. There are many different surgical procedures available. Various new technologies exist that can speed the healing process and increase the strength of the Achilles tendon following surgery. Examples would be biological grafts and platelet rich plasma. Their application is based on the actual location , and degree of pathology of the tendon. .
Distal Achilles Tendinopathy or insertional achilles tendinopathy is a condition that is fairly common. Here the tendon becomes irritated at its attachment point at the back of the heel bone. This may in part be due to bone enlargement in the back of the heel. Often refered to as a posterior heel spur in combination with a Haglunds deformity. This is a prominence of bone at the back and upper outer side of the heel. It can furthermore be associated with bursitis between the tendon and the bone.There are conservative methods that should be tried intially for treatment however when these methods prove ineffective and the condition is chronic surgical methods are fix the condition.On some ocassions MRIs are obtained and with clincal examination and xray evaluation the appropriate surgical procedure is determined. One such procedure is demonstrated with the picture at the top right of this section.. These newer methods improve outcomes and return patients to normal function faster.The color schematic diagram above is a rendering of the surgical procedure that effectively treats this problem in a contemporary way.